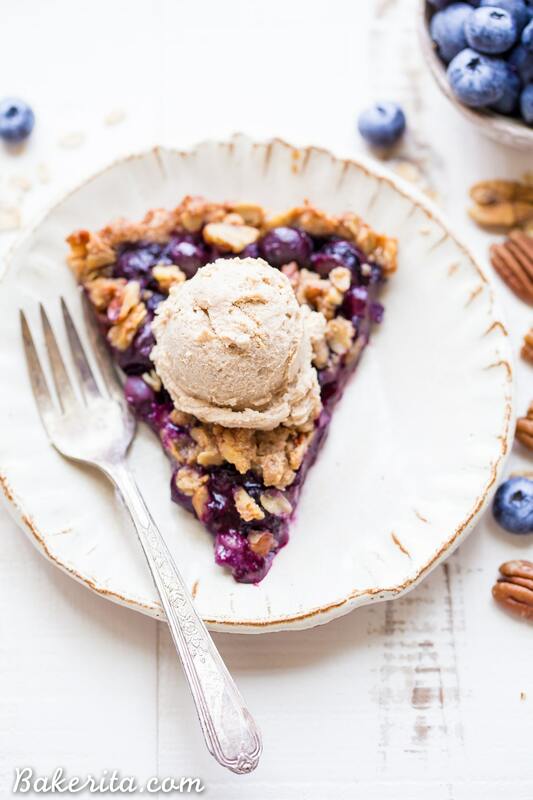 This Blueberry Crisp Tart with Oatmeal Crust comes together quickly and easily, and it’s the perfect use for your fresh blueberries! This simple recipe is gluten-free & vegan. 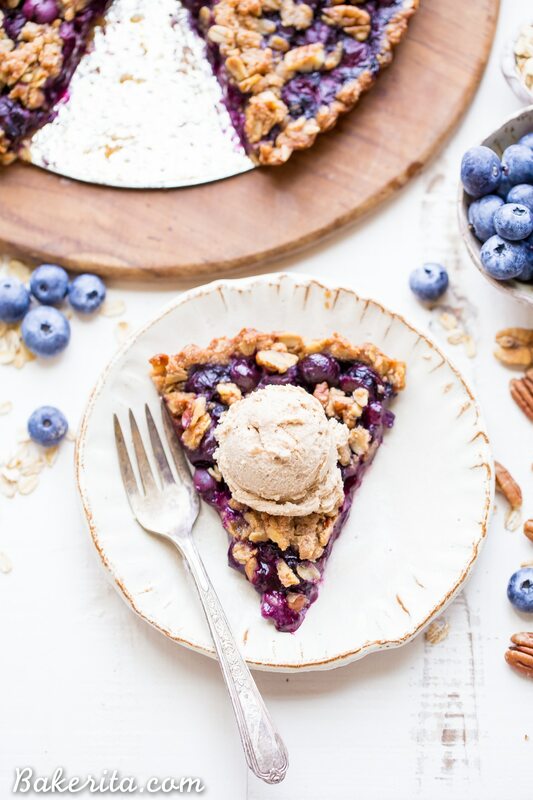 ***2017 Update*** Oh, Blueberry Crisp Tart – you’re a major favorite. Since I first posted this recipe back in 2014, before I started my senior year of college, it’s been very well loved. I get pretty regular feedback on this tart, and I always want to reshare it, but the old photos did NOT do this incredible tart justice. I took the opportunity of having too many blueberries in the fridge to remake this old favorite and make it look a little prettier :) it got devoured in about 24 hours in my fridge, and I don’t suspect it will last much longer in yours  it’s a must try, for sure. I left the original post below (for nostalgia’s sake), but the recipe is true to the original. Enjoy! Soo…if you follow me on social media (Instagram – Twitter – Facebook, if you’re interested! ), you might’ve seen me go a little baking crazy yesterday. It had been a while since I did a crazy weekend of baking, and I took advantage of most of my housemates being gone to make lots of treats to post for you! Baking is my personal form of self-therapy, and spending the whole day baking yesterday just makes me want to do it all over again today! Minus clean-up – that’s a part I’d always be willing to skip. Let’s talk about the fun stuff though: the baked goods!! The recipe I’m sharing with you first is the last thing I made yesterday, and I adore the way it turned out. This tart was born out of necessity: I had waaay too many blueberries in the house and needed them to be used before they went bad. Blueberries in Seattle are so cheap, like, $3 for 18 oz., so I can never resist buying them at the grocery store! I needed to do something with all those blueberries though, so after a little consult with my housemate Olivia about the best route to go, we decided on a blueberry tart, baked until crispy and bubbling, on an oatmeal crust. A little bit of that crust was repurposed as a crumbly topping, with some pecans for good measure and a little extra crunch. As I started playing with the ingredients list, I realized this recipe would be super easy to make gluten-free and vegan with a little bit of substituting, and I’m a major fan of almond flour tart crusts (case. in. point.) so I went for it, and hoped no one would notice it was “healthy”. You totally can’t tell. The berries provide enough sweetness in conjunction with the little bit of honey or maple syrup, and the crust browned up so nicely! The almond flour/oatmeal combination is perfect, and I can definitely see this becoming a crust I use again. It does brown up pretty quickly, so I recommend tenting with foil after about 15-20 minutes when the tart is just a light golden brown. I probably could’ve tented mine even earlier! 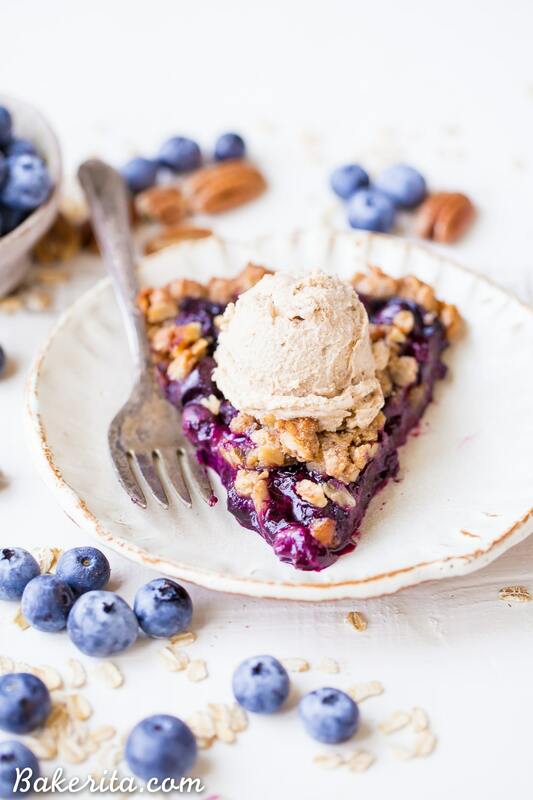 This Blueberry Crisp Tart is super versatile, and would be absolutely delicious with raspberries or blackberries…or a combo of all three! This will most definitely be happening again with some other berries this summer. If you’re a granola fiend, try out this Blueberry Almond Butter Grain-Free Granola. 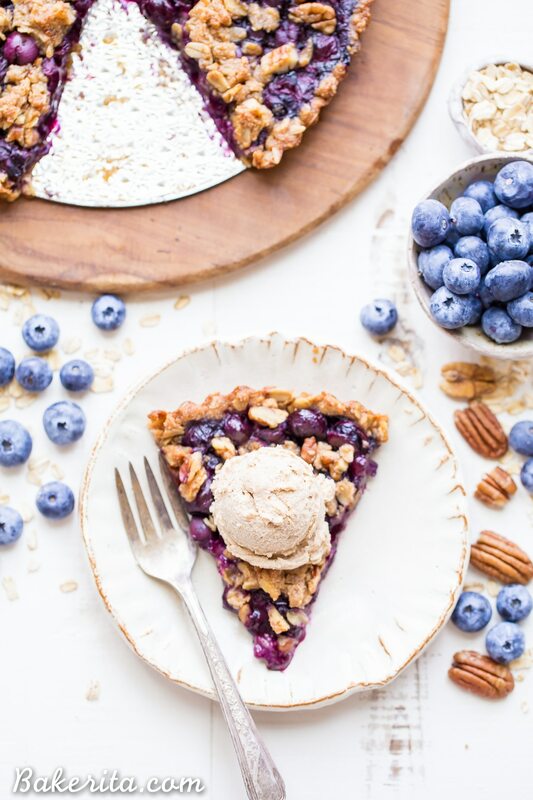 You’ll be super impressed with the taste and texture of this vegan No Bake Layered Blueberry Cheesecake. This Blueberry Muffin Oatmeal will have you hopping out of bed in the morning! Add blueberries, honey or maple syrup, and tapioca starch to a medium bowl and toss until coated. Set the blueberries aside while you make the crust. Add the almond flour, oats, honey or maple syrup, baking powder, and salt to a different bowl and whisk until combined. Add the coconut oil and use your fingers to work it in until coarse crumbs form and the mixture holds together when pressed. Remove a heaping 1/2 cup of the crumbs for the topping and pour the remaining crumbs into the prepared tart pan. Press the dough evenly into the pan. Pour the blueberries over the crust, making sure the juices stay behind in the bottom of the bowl. Add the chopped pecans to the remaining crumble and sprinkle evenly over the top of the berries. This tart gets better with time and will be just as good on day one as day three thus making it a perfect make-ahead dessert. Also, if you don’t have a tart pan, this recipe would work wonderfully as bar cookies. Bake in an 8×8 pan then slice into small square cookie bars. Use maple syrup to keep this recipe vegan, since honey is not vegan. 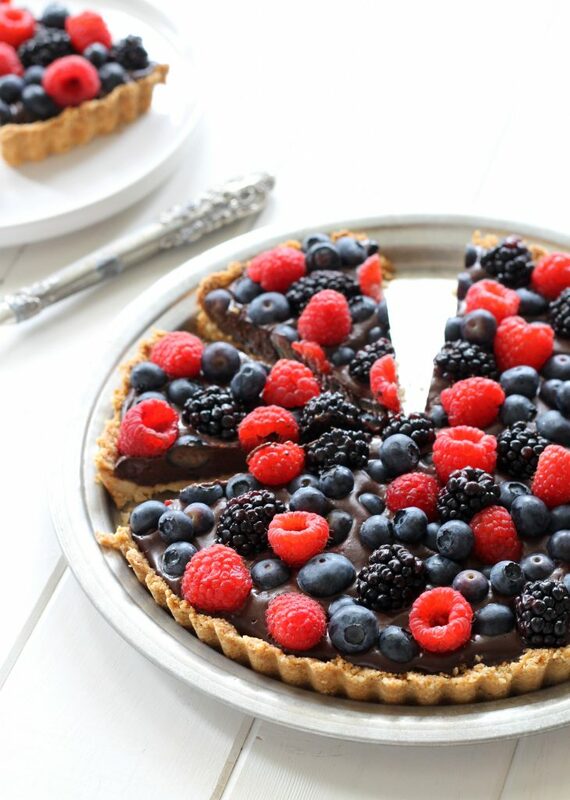 Oh my wow, Rachel – this tart looks beautiful! Not in a million of years would I rell it is healthy!! Can’t wait to try it! It looks delicious! How much coconut sugar and cinnamon? I didn’t see it in the ingredients list, but only to add these in on the instructions. Did I miss it? Thanks for sharing the recipe!!! So much crumbly goodness! This is one of those times I really wish I had magical powers that would allow me to grab a slice of this through the screen. Can’t wait to see all the other yummies you made! Whoa! This was totally the way to go to use up all those amazing blueberries! It looks delicious. Awesome shots! I bake for stress relief too, so I totally understand your spree! 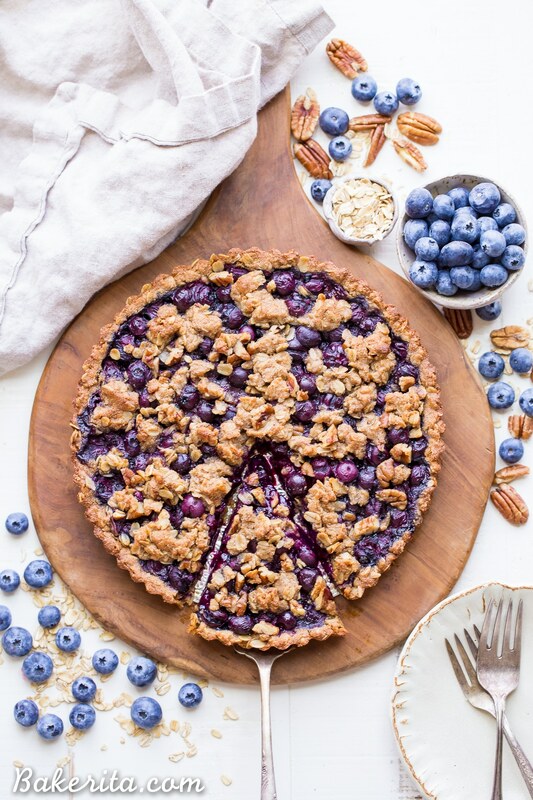 And this blueberry tart looks perfect! I love anything with a crisp topping! Pinned! This looks super delicious and moist. And I am surpriced and excited that there is no egg and butter on the crust.Thanks. What a handsome tart! I love that ingredient list; I bet those flavors are heavenly together. Thank you for sharing! OMG, amazing blueberry tart. One piece for me please. Looks great can’t wait to try. What can I use instead of tapioca starch? oooo love those nuts in the dough – so good. How are blueberries so cheap for you?!! I feel like I spend so much on berries in San Francisco?! I don’t know how they’re so cheap, but when I saw that price I had to get them! Wish you had them so cheaply as well…they definitely get expensive! This is SO GORG girlfriend. My tastebuds wanna eat it, and then my eyeballs say NO, it’s too pretty. My tastebuds usually win, thank goodness! Pinned! This is beyond gorgeous! And I can never resist crumbs. Love every part of this! This stole my heart! What a gorgeous creation! Hi Sarah! I’ve actually never worked with King Arthur GF Flour, so I’m not sure how it compares to almond flour. I think the recipe should still work, but the texture and flavor will probably be a little bit different. IF you try it, I’d love to hear how it turns out! :) Thanks for coming by Bakerita! This. is. INSANE! This is ridiculous in the best use of the word possible. Really!!! Love gluten-free desserts and to top it off, your photography is so on point! I just want to dig right in to this slice! The presentation and photography here are perfect! 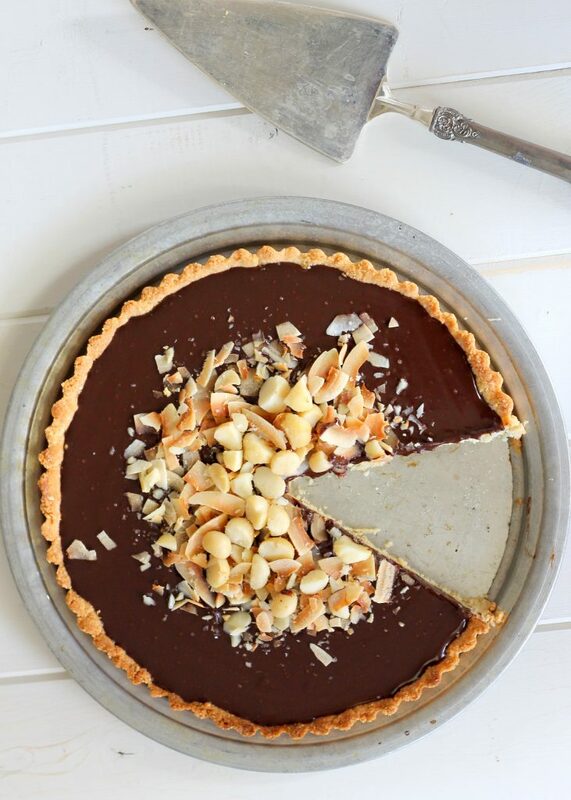 Love the idea of a crisp + a tart and YAY it’s vegan! This looks so delicious, I love the healthier crust.. I will definitely try this out! This tart looks like something I would love to devour! Having too many blueberries is a really great problem to have :) I wonder if it would be possible to do this will all almond flour? Or would it not hold together without the oat flour, do you think? I made this today & it’s fantastic! I baked it in an 8×8 pan. I added lemon zest to the blueberries & I used organic Grade B maple syrup instead of honey. Woohoo! So glad it worked out for you :) thanks for letting us know about the changes you made! The only thing I noticed – and it may be because I subbed maple syrup & used Trader Joe’s gluten free oats, which don’t seem as thick as old fashioned oats- is that my crust mixture wasn’t crumble at all, it just mixed up into a very thick dough. It was fine & tasted great, so I’m going to make it again the same way! Even my 14 year old son, who dislikes blueberries, devoured it! Awesome recipe! I’m always looking for a simple dairy free and gluten free tart recipe, and this fits the bill perfectly! Wowwweeee, that looks beautiful!! It looks pretty healthy too ;) I would totally polish off a slice (or three) for breakfast! Wow I love this recipe so much. I’ve already made it twice in less than a week! I added 1/2 tsp of ground ginger and ground cinnamon each to the blueberries and it was divine. My family and friends gobbled it right up. I also love how healthy this is, I don’t feel bad at all nibbling on it for breakfast the next morning. :) Thanks so much for sharing! Sounds delicious! Thanks for your tips, Taylor – and yes, it’s the perfect breakfast treat :) so glad you like the recipe! This looks great! Do you have any suggestions for a different sweetener? I don’t eat honey, and I’m hesitant to experiment on my own. Thanks! Hi Cecilia, I like to use maple syrup instead of honey. Hope you like it! Hope you enjoyed the tart with agave, Elise! I would love to make this for a picnic with the in-laws on Saturday, but I’ve never baked with Almond Flour or Coconut Oil. If I make this with AP wheat flour and butter, would I use the same amounts? I know it won’t be GF, and of course the fat is less healthy, but I don’t want to experiment now (did I mention it’s for the in-laws?). Thanks! Hi Christine! I’ve never tried this recipe with normal AP wheat flour. The butter would definitely sub pretty easily for the coconut oil, but I can’t guarantee how it will turn out with flour. Sorry! 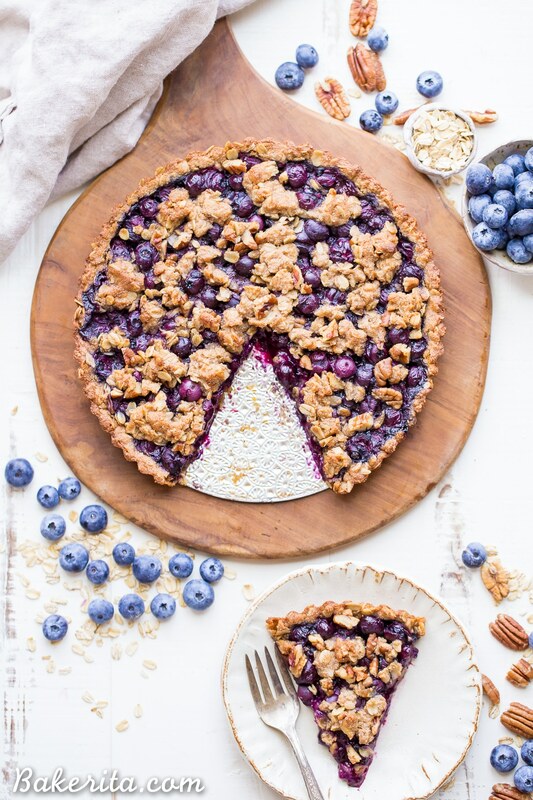 Just found your website thru Pinterest and I’m definitely making this blueberry tart – love blueberries and love a crumble topping. This is a great basic recipe and I can see it making many beautiful fruit tarts…Thanks! It really is so adaptable – any fruit in there would be great! Hope you love the tart! Just want to verify one thing…the recipe calls for 1 cup (4 oz.) of almond flour. I assume the 4 oz should be a WEIGHT measurement, right, since a cup equals 8 ounces wet / dry measurement??? Hi PJ – you are correct! 4 oz. is how much 1 cup of almond flour should weigh out to be when measured correctly. 8 oz equalling one cup is true of water, but for dry ingredients and other liquids, the weight of 1 cup can vary drastically. Hope this helps! I’m excited to try this recipe. Was planning on making it this weekend but I couldn’t find fresh blue berries today! Would this also work with frozen blue berries? Thanks! I made it with frozen blueberries (since I didn’t have fresh) and I also used maple syrup instead of honey becuase that’s what I had on hand and it came out soooo yummy! I can’t wait to make all you other tart recipes! Awesome Marie – I’m so glad that it turned out so well for you!! Thanks for letting us know that your changes worked. Hi again, I made this tart a few times now – its so easy and super delicious. Just curious – the 3rd picture down from the top – what did you put on the tart? Looks like some kind of cream. Is it something vegan? Thanks! What could you use instead of almond flour? Hi Stephanie, any type of nut flour would work, or you could sub in another GF flour. Oat flour is another favorite of mine that would work well here. Enjoy! Made this for my hubby the other night and it is UNBELIEVABLE!!! I will be making this over and over again since my husband went nuts over it. I LOVE that it is made with healthier ingredients but still tastes decadent and delicious. I just sent it to a friend who’s son needs to eat gluten free – I know they will love it, too! THANK YOU!!! I’m so glad you enjoyed the recipe, Jenn! This comment is such a compliment, and I’m thrilled it turned out well for you. Thanks for commenting! This just sounds (and looks!) perfect for an upcoming high tea! Not too much ingrediënts, not too hard to make, and delicious I think. With some of my absolute favorite ingrediënts: blueberries & oatmeal! Pinned, of course :). Yum! I made this for dessert as we had guests for dinner that were vegan, and my daughter is following a dairy-free diet so this tart fit in with everyone’s dietary requirements. It is delicious!!! I WILL be making this again. Just made this dessert tonight :) It was so delicious!!! I served it with some almond milk ice cream and it was absolutely divine :) I will definitely be making this again, thank you! Just made this yesterday, and didn’t pay attention to the “solid” qualification of the coconut oil until I was already halfway through. I immediately panicked, because although I’m from California, I’m currently living in Costa Rica…where my coconut oil is liquid. All. the. time. However, I added about 1/3 cup oats, and it seemed to balance out! I also had to substitute all-purpose flour for tapioca, because tapioca is no where to be found down here. Woohoo. Thanks Rachel! It was a hit, and I can’t wait to make it again. Would it be possible to make this with frozen berries, or would it be too soggy? 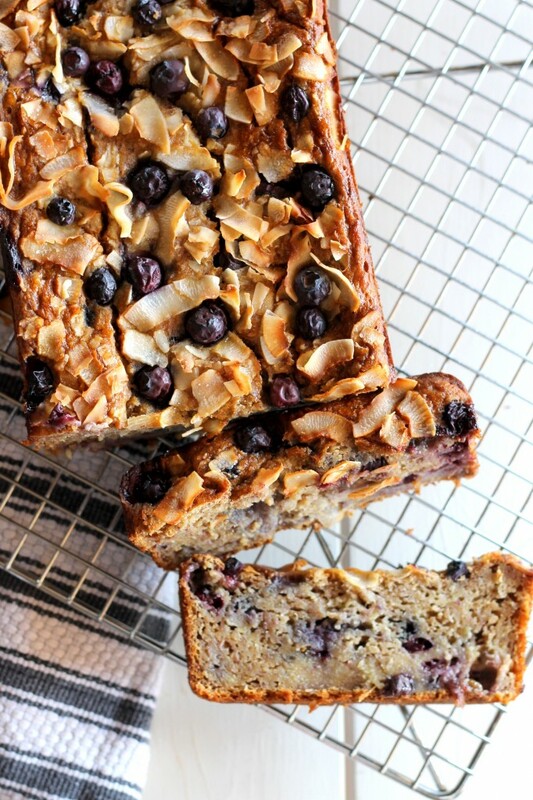 I just made this with whole wheat flour, frozen berries, and cornstarch and it is delicious! My 4 year old and 2 year old love it too. I don’t need to be GF but I saw an extremely similar version of this made with sugar and a lot of it and wanted to find something not so sweet and this was perfect. It was a little tricky mixing the honey with the frozen berries because they cooled down the honey and made it harder to spread out but it was hardly a big deal. Thanks so much for this truly guilt free recipe! So glad this recipe was a hit, Molly! Good to know those changes work well here, too. Thanks so much for sharing! If I make this the day before serving it, do I need to keep it in the fridge? So glad to hear it, Jade! Thanks so much for sharing your experience with me. Could I use coconut sugar instead of honey/maple syrup? If so how much should I use? Hi Jessica. In the filling it wouldn’t be a problem and can be subbed 1:1, but in the crust, the honey/maple syrup helps hold the crust together – I’m pretty sure it would be too crumbly without that to help bind it. I would recommend sticking to the honey or maple syrup for best results. Our guests really enjoyed this recipe! It’s a keeper. So good to hear! Thanks for letting me know, Ann. Just about to prepare this for a 4th of July gathering and I’m going to add raspberries. What cream did you use to pour over it before serving? Yes I bought a condensed coconut milk to pour on top and it was delicious! Mmm that’s a delicious choice!! So glad you enjoyed it, Melissa. Hi! I love this recipe, mine is in the oven as I type! . Did you use oats or oat flour?? Wondering because your crust looks more ground and mine you definitely see the oats. I had to make a little extra crust I could barely cover the 8×8. (Another reason I’m wondering about flour?) . I also didn’t have quite as many blue berries so I used half fresh and half frozen. I added lemon zest to the berries and cinnamon to the crust!! Can’t wait for it to be done! Thanks for the great gf recipe!! Very approachable, clean and smelling delicious so far!!!! Hi. Just saw this recipe on pinterest and wondering if I could replace the almond flour with coconut flour and add extra oats, instead of nuts for the crisp topping? Thanks. Hi Donnette. Unfortunately, coconut flour is it’s own beast and doesn’t substitute well for other flours because it’s so highly absorbent. I’d recommend sticking with almond flour or another nut flour here. As for the nuts, you can just leave them out – no need to substitute with extra oats. Hope this helps! I used a little less maple syrup in the crust than it called for and it was still plenty sweet enough for me. Will try reducing even more next time but don’t want to lose the wonderful consistency. And you are correct about it possibly being even better after sitting a couple days. I just finished the leftovers and they were divine! Thanks for the fabulous recipe! So happy to hear it turned out so well, Charlie – it’s definitely an adaptable recipe! It makes me smile to hear about your recipe success. The mango sounds like a fabulous addition! Hi Lacey – I don’t make my own because I find it more consistent to purchase it, but you can! Just be sure not to over process it in the Vitamix or it will turn into almond butter. What is the tapioca strach roll here? Hi Nurit, it helps the blueberries thicken instead of getting too runny. You could probably do without it, but the blueberries might bleed a bit. Have been making this for about two years now- it’s so ridiculously good. Just made one yesterday which is near gone. My next one I’ll be making with cherries though I can only find frozen ones. So I will thaw them and see how that turns out. Thank you for a really superb recipe! this looks amazing- question though. can you use frozen blueberries? Hi Joanne – yes that should be fine! The filling may just be a bit more jammy/liquid-y because of the extra water from the frozen blueberries. I read that rinsing and drying frozen berries will get pretty good results- I don’t want to wait until fresh are available to make this- it looks so good we need to make now!! Made a double batch of this as a bar cookie in a 9×13 pan using strawberries and rhubarb instead of blueberries. Nice and sweet-tart. My coconut oil was not completely solid, so my ‘dough’ was sticky and would not spread in as thin a layer on the bottom of the pan as I wanted. So, I ended up with only a little left to put on top. I extended it by mixing in an extra half cup of oats and some chopped walnuts (because that’s what I had), and it worked out fine. It is not really a cookie consistency, as it is pretty fragile and crumbly, but it tastes wonderful. Thanks so much for your feedback, C! So glad it worked out, and that you enjoyed it. This looks phenomenal! Love the ingredients list too; def need to give this one a try! Its like blueberry pie and crisp in one delicious form! I’m all about the blueberries rn! Thanks for the love Bethany! I am in love with just how gorgeous the tart looks. Wait till I sink my sweet tooth into this when I try this myself at home! Who would believe that this is healthy! This is outrageously good! Will definitely make it again. Hello! I want to try this recipe but I was wondering if I can replace the almond flour? what do you suggest? Hi Trini, almond flour really is the best choice here. Another nut flour would also work, or possibly oat flour. I’ve only tried as written though! I’ve done half a cup almond flour and half a cup oat flour, and it’s turned out great for me! I’m a big fan of tarts. Fresh fruit with the tart is the perfect combination. I definitely want to add this to my list of recipes to try. Thank you! I hope you love it, Megan – thanks! Hi Laney, I know, that’s why there is a note at the bottom stating to use maple syrup to keep it vegan! Oh I made this. It’s simply delish. Not too sweet and basically an amazing adult dessert. Picked our own blueberries, used maple syrup (cause we are in Canada ) and I ground the oats down to a flour so it wouldn’t make my six year old think it was “healthy”… we all loved it. Thanks. This will be a new staple in my home. Invent some more gluten free dairy free yummies please. So thrilled it was a hit! Thanks so much for your feedback, Liskula. There are lots of other GF/DF desserts on my site if you take a look! And beneficial to humans. I use local raw honey. I enjoy honey too! It’s fine to use in place of maple syrup in this recipe.